Located in Shoreview, a suburb of the Twin Cities, Lakeview Terrace offers residents luxury, superb amenities, and a short commute to both downtown Minneapolis and St. Paul. The apartment units range from 828 to 1,327 sq. 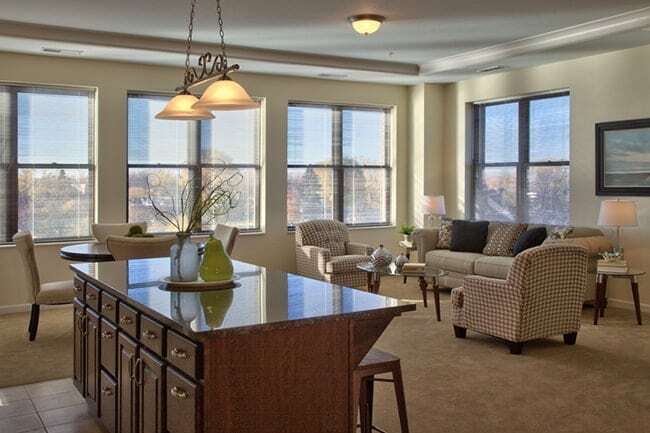 ft., or 1 BR to 2 BR w/ Den, which are perfect for young professionals and families. Each apartment features a spacious floor plan that include a walk-in closet, and South facing upper units will have a beautiful view of downtown Minneapolis and St. Paul. For more information on Lakeview Terrace, contact the Tycon Companies office or view the Lakeview Terrace page on our website. Tycon Companies is one of the Twin Cities premier property management companies. Founded in 1973, we take price in every property we manage. We have apartment rentals throughout the metro area.